airBaltic, legally incorporated as AS Air Baltic Corporation, is a state-owned Latvian low-cost carrier and the country's flag carrier, with its head office on the grounds of Riga International Airport in Mārupe municipality near Riga. 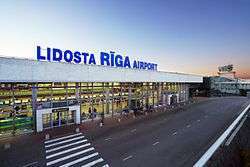 Its main hub is at Riga International Airport with further bases at Tallinn Airport and Vilnius Airport. The airline was established on 28 August 1995 with the signing of a joint venture between Scandinavian Airlines (SAS) and the Latvian state. Operations started on 1 October 1995 with the arrival of the first Air Baltic aircraft, a Saab 340, at Riga, and that afternoon, the plane made the first passenger flight for Air Baltic. In 1996, the airline's first Avro RJ70 was delivered; and Air Baltic joined the SAS frequent flier club as a partner. 1997 saw the opening of a cargo department and, in 1998, the airline's first Fokker 50 plane was delivered. The adopted livery was mainly white, with the name of the airline written in blue on the forward fuselage, the 'B' logo being heavily stylized in blue checks. The checker blue pattern was repeated on the aircraft tailfin. In 1999, Air Baltic became a joint stock company; it was previously a limited liability company. All of their Saab 340s were replaced by Fokker 50s. By September, the airline had begun operating under the European Aviation Operating Standards, or JAR ops. Air Baltic welcomed the new millennium by introducing new uniforms and opening a cargo center at Riga's airport. The first Boeing 737–500 joined the fleet in 2003, and on 1 June 2004, Air Baltic launched services from the Lithuanian capital, Vilnius, initially to five destinations. In October 2004, Air Baltic was rebranded as AirBaltic. Their present livery consists of an all-white fuselage and lime tailfin. AirBaltic.com is displayed on the forward upper fuselage, and the word "Baltic" is repeated in blue on the lower part of the tailfin. In December 2006, the first Boeing 737–300 joined the fleet and was configured with winglets. In July 2007, AirBaltic introduced an online check-in system. It was the first online check-in system in the Baltic states. In Spring 2008, two long-haul Boeing 757 joined the existing AirBaltic fleet. On 10 March 2008, it was announced that in the next three years the airline would acquire new aircraft, experiencing the largest fleet expansion in the company's history. The new additions will be next generation Q400 aircraft. AirBaltic had strong links with SAS, which owned 47.2% of the airline, and operated frequent flights to SAS hubs in Copenhagen, Oslo and Stockholm, and the airline formerly used the SAS EuroBonus frequent flyer programme, but it now has its own: PINS. Some of AirBaltic's products and services are still shared with SAS, including co-ordinated timetabling and shared airport lounges. AirBaltic is not a member of any airline alliance, but does have codeshare agreements in place with several Star Alliance member airlines and others. AirBaltic had secondary hubs at Vilnius International Airport and Lennart Meri Tallinn Airport. The majority of the routes commenced from Tallinn were cancelled shortly after opening, leading to complaints from the Estonian Consumer Protection Department. In January 2009, SAS sold its entire stake in the company (47.2% of the airline) to Baltijas aviācijas sistēmas Ltd (BAS) for 14 million lats. BAS was wholly owned by Bertolt Flick (President and CEO) until December 2010, when 50% of BAS shares were transferred to Taurus Asset Management Fund Limited, registered in the Bahamas. In August 2011, AirBaltic requested more than 60 million lats in capital as its losses continued to mount, and suffered speculation about its financial position and political scandals throughout 2011. In mid-September 2011, the company announced plans to lay off around half its employees and cancel around 700 flights a month to avoid possible grounding. The company also announced that a mystery investor was willing to pay 9.6 million euros for an additional 59,110 shares. On 4 October 2011, the plans were annulled in order to make the necessary investments in the airline's capital. The government of Latvia and BAS agreed to invest around 100 million lats in the airline's share capital in proportion to their stakes in AirBaltic. In connection with the agreement, Flick stepped down as long-term President and CEO of the airline. Martin Gauss, former CEO of Hungarian airline Malév, became the new CEO. AirBaltic had made an announcement on 23 September 2010 that it would establish a new secondary hub at Oulu Airport, but in early 2012 it was confirmed that the Oulu hub plans had been cancelled due to AirBaltic's financial problems. The cost-cutting program, initiated by AirBaltic which aims to return to profitability in 2014, scored better than planned results in 2012, by narrowing its losses to €27.2 million, from €121.5 in 2011. On July 22, 2014, AirBaltic became the first airline in the world accepting Bitcoin for online bookings. The state's shareholding had been 99.8% since 30 November 2011, following the collapse of a bank linked with a finance package negotiated for the airline, but on 6 November 2015 it was reported that the Latvian Cabinet of Ministers had approved plans to sell 20% of airBaltic to German investor Ralf Dieter Montag-Girmes for €52 million and agreed to invest a further €80 million in the airline. The total of €132 million of fresh capital for the carrier is intended to spur its Horizon 2021 business plan and fleet modernisation. Following the closure of Air Lituanica and Estonian Air respectively in June and November 2015, it is alongside Nordica, one of two flag carriers in the Baltic countries. airBaltic operates direct year-round and seasonal flights from Riga, Tallinn and Vilnius mostly to metropolitan and leisure destinations within Europe. Long-haul flights are not operated. Bombardier CS300 1 19 145 145 Launch customer of CS300. AirBaltic is in the process of renewing its fleet of Boeing 737 (nine owned and four leased) with Bombardier CS300 by 2020. The airline expects to receive two CS300 in 2016, six in 2017, eight in 2018 and four more in 2020. On most flights, AirBaltic offers a buy on board menu offering food and drinks for purchase. 17 August 2015: A drunken airBaltic crew, whose co-pilot's bloodstream had seven times the legal alcohol limit, was stopped by the police in Oslo before takeoff. The first officer was given a six months prison sentence while the captain and flight attendants also faced proceedings after an anonymous tip-off stopped them taking charge of a flight from Norway to the Island of Crete. 17 September 2016: airBaltic flight BT641 using a Bombardier Q400 NextGen (registered YL-BAI) from Riga to Zurich made an emergency landing at Riga Airport without its nose landing gear deployed. There were no injuries among 63 passengers and 4 crew members. ↑ "Company history". Airbaltic.com. Retrieved 2013-04-20. ↑ "airBaltic introduces Internet check-in for flights". Airbaltic.com. 2007-07-31. Retrieved 2013-04-20. ↑ "Opening of Tallinn Base". ↑ "Warning About Cancellation of Flights From Tallinn". ↑ "Changes in airBaltic shareholders structure". Bnn-news.com. 2010-12-16. Retrieved 2013-04-20. ↑ "AirBaltic in need of massive investment as losses mount". Baltictimes.com. 2011-08-19. Retrieved 2013-04-20. ↑ Toomas Hõbemägi (2011-06-27). "Antonov: airBaltic will continue its business". Balticbusinessnews.com. Retrieved 2013-04-20. ↑ Toomas Hõbemägi (2011-09-14). "Tallinn Airport: airBaltic owes us money". Balticbusinessnews.com. Retrieved 2013-04-20. ↑ Toomas Hõbemägi (2011-06-28). "Bookinghouse stops selling tickets to airBaltic flights". Balticbusinessnews.com. Retrieved 2013-04-20. ↑ "airBaltic starts cancelling flights". Baltictimes.com. 2011-09-13. Retrieved 2013-04-20. ↑ "Former Latvian president unleashed on the head of airBaltic corruption fighters". Bakutoday.net. Archived from the original on 2012-03-25. Retrieved 2013-04-20. ↑ "Suspected illegal activity haunts airBaltic". Baltictimes.com. 2011-09-14. Retrieved 2013-04-20. ↑ Toomas Hõbemägi (2011-09-16). "airBaltic starts massive layoffs". Balticbusinessnews.com. Retrieved 2013-04-20. ↑ "Update: AirBaltic cancels flights through December". Intelliguide.com. Archived from the original on April 2, 2012. Retrieved 2013-04-20. ↑ Toomas Hõbemägi (2011-09-13). "Breaking news: airBaltic sells shares, cancels flights". Balticbusinessnews.com. Retrieved 2013-04-20. ↑ Alla Petrova (2012-10-17). "Agreement officially signed on bail out of airBaltic". Baltic-course.com. Retrieved 2013-04-20. ↑ Latvian government approves airBaltic deal Archived April 3, 2015, at the Wayback Machine. ↑ Toomas Hõbemägi (2011-10-24). "Martin Gauss confirmed as new CEO of airBaltic". Balticbusinessnews.com. Retrieved 2013-04-20. ↑ "Air Baltic Setting up Oulu Hub". YLE News. Helsinki: Yleisradio Oy. 23 September 2010. Archived from the original on 26 September 2010. Retrieved 23 September 2010. ↑ "airBaltic to Open a New Hub in Oulu, Finland". Riga: A/S Air Baltic Corporation. 23 September 2010. Archived from the original on 24 September 2010. Retrieved 23 September 2010. ↑ "Air Balticin solmusuunnitelma kuivui kasaan" (in Finnish). YLE uutiset. 23 March 2012. Retrieved 5 February 2012. ↑ "airBaltic ahead of schedule to reach profitability in 2014". Centre for Aviation. ↑ "AirBaltic 2012 Loss Beats Plan on Reduced Fleet Size, Christmas". Bloomberg. ↑ bbn.ee "airBaltic's future uncertain after Krajbanka's collapse" Check |url= value (help). ↑ bbn.ee "Latvian government takes over airBaltic" Check |url= value (help). ↑ "German investor for airBaltic". ↑ "New investor completes airBaltic buy-in". ↑ "New investor completes airBaltic buy-in". Retrieved 24 May 2016. ↑ "airBaltic Announces 2007 Financial Results". airBaltic. Retrieved 31 May 2013. 1 2 "airBaltic in 2008 carried 29% more passengers than the year before (archived)". airBaltic. Archived from the original on May 13, 2011. Retrieved 20 August 2013. 1 2 3 "airBaltic and SMS" (PDF). airBaltic. Retrieved 17 December 2015. 1 2 "airBaltic's restructuring plan is in full swing, but competition from Estonian Air is rising". CAPA Centre for Aviation. Retrieved 31 May 2013. 1 2 "airBaltic carries over 3 million passengers in 2010". airBaltic. Archived from the original on 13 May 2011. Retrieved 31 May 2013. 1 2 3 "airBaltic Beats Expectations for 2012, Improves Result by LVL +66 Million". airBaltic. Retrieved 31 May 2013. ↑ "Latvia steps in to save national carrier AirBaltic". Reuters. Retrieved 31 May 2013. 1 2 "Restructuring rigour from Riga: airBaltic narrows 2012 net loss". CAPA Centre for Aviation. Retrieved 17 December 2015. ↑ "airBaltic Serves 3.08 Million Passengers in 2012". airBaltic. Retrieved 31 May 2013. ↑ airBaltic. "airBaltic Profits and Annual Report Approved". ↑ "airBaltic concludes the year 2014 with EUR 9 mln profit". The Baltic Course. Retrieved 7 April 2015. ↑ "airBaltic serves 2.63 million Passengers in 2014". AirBaltic. Retrieved 17 December 2015. ↑ "airBaltic posts €19m profit in 2015". LSM.lv. eng.lsm.lv. 12 May 2016. Retrieved 28 May 2016. ↑ "Profile on airBaltic". CAPA. Centre for Aviation. Archived from the original on 2016-10-31. Retrieved 2016-10-31. 1 2 3 "Latvia's airBaltic will gradually renew fleet with Bombardier CS300 aircraft (Dec 2, 2016)". Baltic Course. Retrieved 3 December 2016. ↑ "AirBaltic fleet list at planespotters.net". Retrieved March 29, 2015. ↑ "Air Baltic Accelerates Fleet Renewal Plans". ↑ "airBaltic opts to acquire CSeries aircraft as part of turnaround effort". ↑ "airCafe." AirBaltic. Accessed 30 October 2008. ↑ anna.aero. "Introducing the Euro annies – proper awards based on science, statistics and evidence". anna.aero Airline News & Analysis. ↑ eng.lsm.lv. "airBaltic named world's most punctual airline (again)". ↑ "the guardian news article". ↑ "airBaltic's Bombardier Q400 Emergency Landing in Riga". aviationvoice.com. Retrieved 20 September 2016.